This quality 10-piece camping cookware set includes all you need to prepare food and meals when out in the wild. Prepare several dishes at once for you and your friends with the non-stick frying pan, or one of the camping pots over the fire. Insulated handles ensure safe handling of hot pots and pans while cooking. The handles also fold in when not in use, saving more room. The entire cookware set was designed for durability and rugged outdoor use, and is the perfect portable kitchen mess kit for long treks. Use any of the other three plastic bowls to either serve or keep prepared foods in - and when you're done, easily clean it all up with the included sponge. The non-stick surface treatment prevents odors or food remnants to remain, while simultaneously making every piece very easy to clean. Stackable design saves space, and allows for easy storage and portability. Weighing in at just under 2 pounds - the anodized aluminum cookware set is light-weight to carry. Easily fit it among your other items in your backpack, or hang it onto your gear using the included mesh storage bag. Eat on the go when backpacking, hiking, camping or hunting, with this lightweight 10 piece camping cookware set from Rough It. 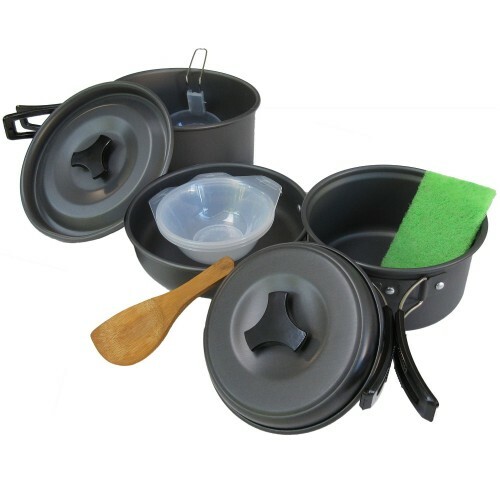 This camping cookware set comes with a frying pan, two boiling pots, three bowls, and a set of utensils for eating and cleaning. The cooking set is made with Anodized Aluminum and has non-stick surface, ideal for cooking meals and cleaning up on the go. 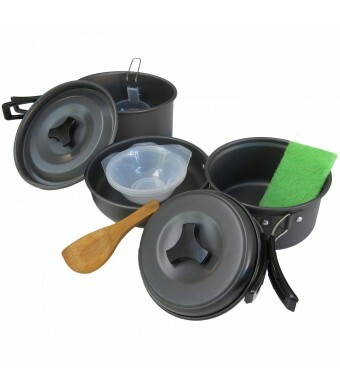 The Rough It Camping Cookware set weighs less than 2 pounds and stacks within itself for easy transportation. Comes with a handy carrying bag so you can keep it handy around base camp or hang it on your gear when you go backpacking as part of your equipment. Insulated handles ensure safe handling of hot pots and pans while cooking. The handles also fold in when not in use, saving more room. The entire cookware set was designed for durability and rugged outdoor use, and is the perfect portable kitchen mess kit for long treks. Combine this complete set with a Rough It burner, and you can have a hot meal wherever you happen to be!